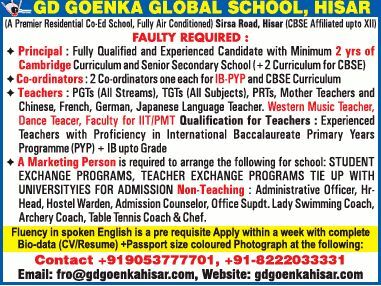 G. D. Goenka Global School, Hisar has advertised in THE TIMES OF INDIA Newspaper for the recruitment of PGT plus TGT plus PRT job vacancies. Interested and eligible job aspirants are requested to apply with in a week. Check out further more details below. About School: G. D. Goenka Global School, Hisar ensures that no child is left behind in learning academic and life skills. To achieve this goal, we the Goenkans, give the learning environment to the children with focus on their mainstream. Students learn best when they actively participate in the lesson or that they feel valued when teachers encourage them to share their knowledge with their peers.